After the U.S. Army Corps of Engineers (COE) announced it will deny the easement for the Dakota Access Pipeline (DAPL) to be drilled under Lake Oahe – the drinking water source for the Standing Rock Sioux – the oil company was quick with its response. 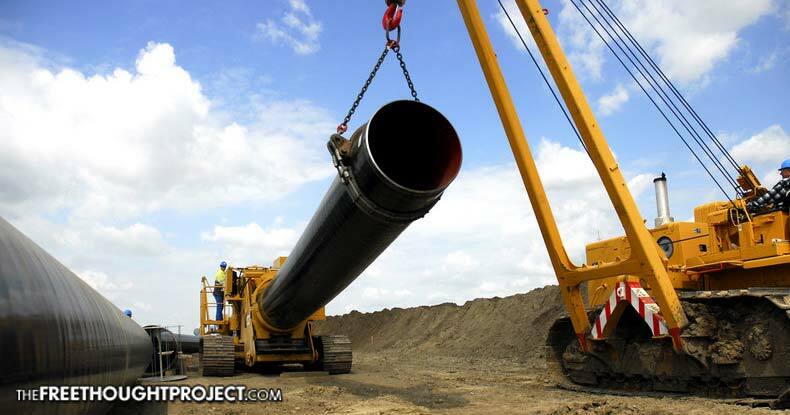 Energy Transfer Partners (ETP) openly stated it would ignore COE’s decision and plan to continue installing the pipeline in the original route, calling the decision a political move by the Obama administration. Contrary to this statement, DAPL is not “vital” to the already overbuilt transport capacity of the Bakken oil fields (more on that later). But political posturing is not enough to explain ETP’s frantic push to complete its high-risk investment project. After delays caused by months of protest at Standing Rock and direct action elsewhere, another delay in the form of having to reroute the pipeline could spell financial doom for the entire $3.8 billion DAPL project. According to the Institute for Energy Economics and Financial Analysis, DAPL is on the verge of becoming a “stranded asset” due to several factors, including the high-risk financing behind the project and the potential for shipping contracts to be cancelled or renegotiated. The report describes financial weaknesses in the project and the fact that the oil-transport infrastructure for the Bakken region is already overbuilt, with 60 percent of existing infrastructure underutilized. Also, low oil prices have contributed to a drop in Bakken production (20% from its 2014 peak) and declining interest in drilling new wells – further negating the need of DAPL. All of these factors make for a greater likelihood that oil shippers will choose to use existing transport methods, rather than wait on a pipeline that isn’t even necessary, or will renegotiate terms which would sink ETP’s profits. “The broader economic context for the project has changed radically since ETP first proposed it, in 2014. Global oil prices began to collapse just a few months after shippers committed to using DAPL, and market forecasters do not expect prices to regain 2014 levels for at least a decade. As a result, production in the Bakken Shale oil field has fallen for nearly two consecutive years, creating major financial hardships for drillers. Because the economic prospects for Bakken oil producers have dimmed dramatically since early 2014, oil shippers—in the interest of protecting their investors and shareholders—may attempt to renegotiate terms when ETP misses its Jan. 1 deadline, seeking concessions on contracted volumes, prices, or contract duration. The entire fiasco of DAPL underscores the futility of clinging to fossil fuels, and the absurdity of massive investments in oil with its notoriously volatile prices. The reality is that market forces are propelling renewable energy to eclipse dirty fuels. In pushing destructive, unnecessary projects like DAPL, Native American rights and the rights of landowners are systematically ignored and dismantled. Fortunately, the incredible efforts of water protectors and those joining the Standing Rock Sioux in solidarity have had a profound effect. The tribe’s water source might actually be protected if ETP does not violate the law. The protests have also exposed the wanton disregard for Native American rights by corporations and government, the willingness of police to become militarized protection services for corporations, and the destructive way in which fossil fuel companies go about their high-risk business.